The beginning of the new year is a popular time for reflection and goal setting. One of the best techniques for collecting and organizing your thoughts around the coming year is creating a mind map. Mind maps are powerful visual diagrams perfect for facilitating brainstorming sessions like these. They allow you unrestricted space to layout and organize your thoughts. Best of all, a completed mind map offers you a higher level perspective of your ideas in general. You’ll likely gain important insight into your life just by writing out all of your goals in one place. 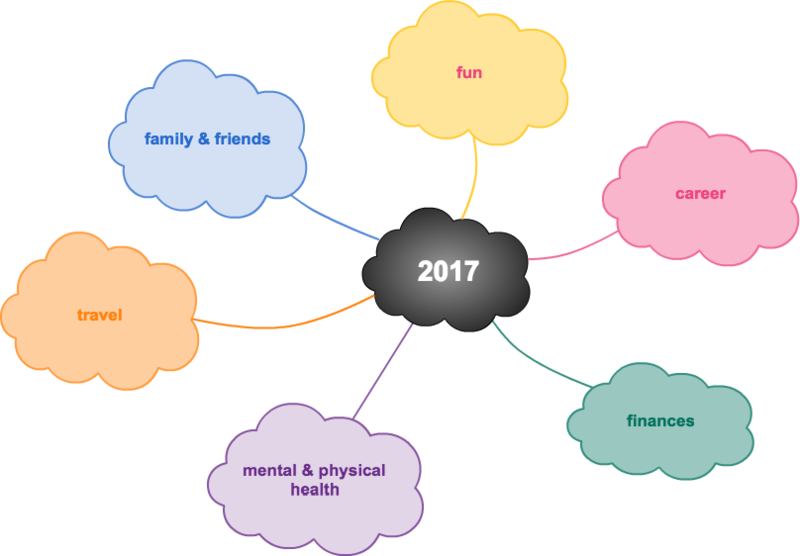 Ready to create your 2017 mind map? Let’s get started. Start by dividing your life into its different components. For example, you may want to create a category for your family & friends, career, a particular passion, your finances, romance, your mental & physical health, travel, and good ol’ fun. You can have as many categories as you want. The goal is to have the structure of your mind map reflect the structure of your life. Once your categories are defined, you can begin free-writing any thoughts, feelings, or observations about each. What’s most important to me about this part of my life and why? What would success ideally look like to me? What’s the one thing I would change if I could? Maybe you decide you’d like to take a cooking class this year. Maybe you realize stress reduction needs to become a higher priority in your life. As you make these observations, write them down. This is a powerful brainstorming tool that can inspire untapped creativity, so don’t edit your thoughts as you expand your diagram to encompass the full potential of where your year (and life) could go. The sky is the limit during this step, so go big and small. 1. How much of a positive impact will this have on my life? 2. How attainable is this goal? You want to get down to a few core goals for each section that will be of the greatest impact to your well-being while also being realistic. Yes, saving $1,000,000 this year would likely be hugely beneficial to your life, but for most of us (though not all! ), this goal is unrealistic. If prioritizing savings for retirement or college funds or paying off debt is important to you this year, think about what you could realistically contribute to this area before committing to it. The last thing you want to do is create an amazing set of thought-out, achievable goals that would improve the life of you and your loved ones and forget about it for the rest of the year. Once you’ve defined your goals, it’s time to commit to them. Split each goal up into actionable tasks and give yourself deadlines. Track your progress and continue to check in throughout the year to see how you’re doing. If you really want to get organized, you can even put your goals into a project management app. Remember: your goals won’t achieve themselves; you have to make a plan and stick to it. Setting a calendar reminder once a month with your mind map image attached. Just do something, anything, to make sure that you’re continuing to revisit your goals and measure your success as you make this year the best it can be. What are your favorite tips for holding yourself accountable for personal goals? Share them with us on Twitter!